On the coldest morning of the year, a tiny, bedraggled kitten is stuffed into the returned book slot at the Spencer Public Library in Iowa. The next morning, librarian Vicki Myron finds him almost frozen to death — and decides then and there that he will become the library’s official pet. As Dewey is nursed back to health, he comes to love his new home in this small midwestern town. He spreads his special brand of affection to the library visitors, winning the hearts of everyone around him. As his fame grows, visitors drive hundreds of miles to meet Dewey, and people from all over the world become his ardent fans. Through it all, Dewey remains a loyal companion – a beacon of hope not just for Vicki, but for the entire town of Spencer as it pulls itself up from the worst financial crisis in its history. This is Dewey’s unforgettable true story, which proves that real love comes in many forms. wow,It sounds good so far. I am reading this now and about half way trough. Its good so far and I camt wait to read it some more at bedtime!!! 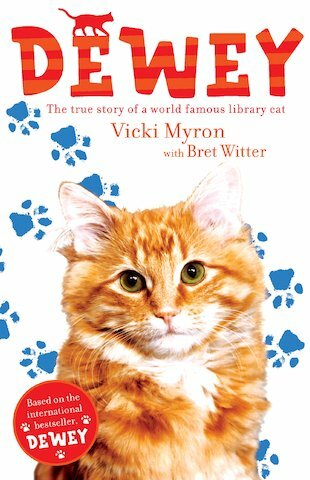 Vicki Myron – author and narrator of this very touching book relates the true story of Dewey, a tiny kitten she found pushed through the book-return slot of Spencer library, Iowa. The library staff decided to keep him and named him Dewey. Dewey attracted immense media attention, resulting in people travelling not only from the US but from all over the world to catch a glimpse of him. Set during the US farm crisis of the 1980’s, Dewey gave the town something else to think about. He had this special knack of making visitors of the library feel good once they arrived there and touched the hearts of many people. Dewey was an exceptional cat. He loved the townsfolk of Spencer and would greet them as they came in the library door. He was good – natured and would enjoy nothing better than a game of hide and seek or snuggling up on the knee of a delighted visitor. The story also covers Vicki’s life story, which includes her own illnesses and losing family she was very close to. I cried buckets at the end of Dewey’s happy life. I loved Dewey like he was my own. It’s a charming story that even non animal lovers couldn’t help but like. A truly wonderful read that I highly recommend.